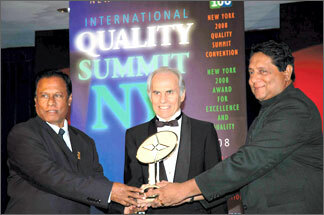 Co-operative Insurance, a licensed insurance company whose major shareholders are the country's co-operative societies, did Sri Lanka proud when it won the International Quality Summit Award in the Gold Category at the International BID Quality Convention at the Marriott Marquis, New York on May 26. Co-operative Insurance Managing Director W Upali Herath, President BID Jose Prieto and Co-operative Insurance Chairman W Lalith A Peiris with the Gold Award. Business Initiative Directions (BID) is an international firm which is a leading exponent of Total Quality Management (TQM) and has the distinction of designing the QC100 TQM model, recognised internationally as a pattern model of TQM. Since the mid 1970s, BID began developing quality award programmes based on the QC100 model which have become the benchmark for recognising TQM standards around the world. Awards are presented in three categories: Gold, Diamond and Platinum. It is a singular honour for Co-operative Insurance to win the Gold Award from among scores of firms from over 65 countries. The award ceremony at the world's premier financial capital was presided over by President and CEO of BID Jose E. Prieto, along with outstanding personalities from the business world and the diplomatic corps in the USA. Co-operative Insurance which began operations as a public limited liability company in 1999 offers life and other types of general insurance through 35 branches and 28 service centres islandwide. The company largely serves the rural sector.